Local Government elections, seen to be close on hand only just days earlier, have become yet so far now. The expected January 20, 2018 poll may now not happen. This time it is over another mundane issue – the creation of more Pradeshiya Sabhas in the Nuwara Eliya district. This is a long standing demand from the plantation sector pro-Government political parties. The Government heeded their request when the Elections Commission is readying for the local polls. It comes amidst widespread belief that the Government wants to further delay the local elections. That too, in the aftermath of rushing through the Provincial Council Election (Amendment) law in Parliament. This effectively blocked early polls to PCs. Already, the Councils in the Sabaragamuwa, North Central and Eastern Provinces have come under Governor’s rule. A five-member Delimitation Committee, in keeping with the new law, is now busy demarcating boundaries of provinces, a time consuming task. Its first priority has become the three provinces where the PCs are not functioning now. Even if the committee keeps to a declared deadline of March next year to complete this task, officials say a delay cannot be ruled out. This is in the light of the appeal process when electorates coming under a province are earmarked. Moreover, the same process would have to be extended to other provinces too. 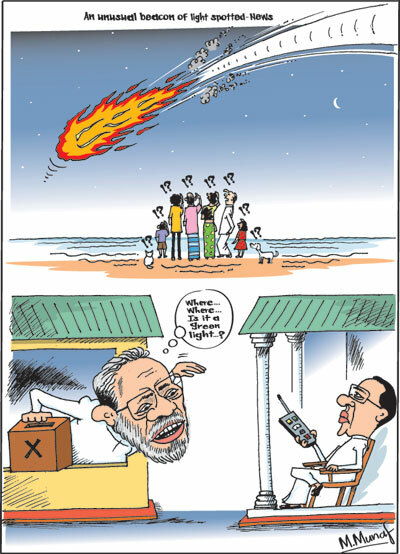 Aggravating public apprehensions were remarks by Election Commission Chairman Mahinda Deshapriya. He told the Sunday Times, “There is no necessity to go through a Delimitation Committee process to create new local bodies. The Ministry of Provincial Councils and Local Government is empowered to establish them.” He cited an instance in the Polonnaruwa district where the Ministry took a similar course of action and resolved a festering issue. The reference is to the carving out of an area from the Tamankaduwa Pradeshiya Sabha and creating a new Municipal Council for Polonnaruwa, President Sirisena’s home base. A similar change is also expected in the Horana electorate. However, Deshapriya said, a final Gazette notification would be required after the creation of such bodies, so elections can be called. In fact, five prominent polls monitoring bodies in the country went in delegation for a meeting with Deshapriya on Thursday. They expressed concern over current developments which they fear would delay polls further. He told the group that the Minister had the power to create new local bodies. In candid remarks he made, Deshapriya said, “I have to take some serious decisions if the Gazette is not issued.” The monitoring bodies, some financially backed by Western governments which promote democracy and free elections, are also to respond jointly if the delay is prolonged. “The Chairman told us he is in a helpless position until a Gazette is issued. He said there was no purpose in his receiving a draft copy for he cannot act on it,” Rohana Hettiaratchchi, Executive Director of the People’s Action for Free and Fair Elections (PAFFREL), said yesterday. He said his party had prepared “proposals and handed over a file to Minister Musthapha a month ago.” He added, “No one can say that elections will be delayed due to this reason. The proposals were ready. We are asking to increase five local bodies to 12 – an addition of seven. “I have spoken at length on this matter when we discussed the new electoral system,” he pointed out. Ganeshan said his party was confident that the changes could be made in “just a few days” since an increase in the number of members in the proposed new bodies would not be necessary. “We are only seeking a separation of some to the new bodies,” he pointed out. As the new cycle of events laid bare an apparent reluctance on the part of the coalition to hold local elections, Minister Musthapha, a one-time vice president of the Ceylon Workers Congress (CWC) declared, “We do not want to do injustice to one minority group.” He said on Tuesday afternoon, he would conduct a discussion with all parliamentarians of the Nuwara Eliya district. They (the parties representing the plantations community) have asked for seven new councils but we have proposed three councils in each area to be divided. He raised a glimmer of hope when he said “if the discussions are successful, I will issue a Gazette notification.” Such a notification, giving the boundaries of different councils and the number of members to be elected, will be the first step to enable the Election Commission to make arrangements for a poll. In any case, he said, within two weeks he hoped to issue a Gazette notification. If he reaches accord with the Nuwara Eliya district MPs, the outcome will have to be placed for approval before the weekly Cabinet meeting on October 31. It is only thereafter, that his Ministry can set about with follow up action. These developments have all but put paid to moves to hold local elections on January 20 next year. Government sources now say it will likely be pushed back to March or even later next year. Musthapha also commented on the format of his Gazette notification. “They are all (political parties in the hill country) asking that it should encompass all councils in one notification. I am also mindful of Government policy of conducting all polls the same day,” he said. However, whether a Gazette would cover all local bodies together awaits a decision. The five Pradeshiya Sabhas which the plantation sector political parties want re-arranged are Nuwara Eliya (134,153 voters), Ambagamuwa (147,607 voters), Walapone (85,111 voters), Kotmale (81,445 voters) and Hanguranketa (72,980 voters). Compared to other existing local bodies in the district, the voter numbers in these five bodies are higher. For example, the Nuwara Eliya Municipal Council has only 19,938 voters, the Hatton-Dickoya Urban Council has 10,849 voters and the Talawakele–Lindula Urban Council 4,853 voters. The coalition move to cause further delays in local polls has angered Opposition political parties. “They are trying to put off elections because they are frightened of losing. They are very unpopular now. The Minister in charge is delaying issuing the Gazette under different pretexts. He is not doing what is expected of him,” declared former President Mahinda Rajapaksa, the leader of the ‘Joint Opposition.’ He returned this week after a private visit to Japan. Rajapaksa forecast that the Sri Lanka Freedom Party (SLFP) would come “third or fourth” at a local election. Asked whether any re-unification effort was under way with one time SLFPers now supporting him, Rajapaksa told the Sunday Times “They (the SLFP) can join the ‘Joint Opposition’ and field candidates. Of course, that will be entirely on our terms.“ With those remarks, Rajapaksa was effectively shutting the door for any last minute rapprochement between the two rival factions of the SLFP. Not that such a move was seriously under way. The gap for rapprochement was widening, not narrowing. To the contrary, conscious of this reality, Sirisena has chosen to oust SLFP electoral organisers who are loyalists of Rajapaksa. “On the other hand,” Rajapaksa declared “if they do not want to contest with us, (‘JO’), the UNP and the SLFP can join together and contest. This will not happen either since yahapalanaya is in tatters”, he said. Rajapaksa will lead the ‘Joint Opposition’ campaign at the local polls. Another key element which the Government wants to introduce in future elections is to legislate to control expenditure incurred by different political parties, their candidates and Independents. On Tuesday, the Cabinet of Ministers approved a memorandum from President Sirisena to introduce legislation for this purpose. Sirisena’s recommendations are based on a report from the Election Commission seeking restrictions on the use of campaign funds. One Cabinet Minister who did not wish to be identified said the proposed new laws were intended to prevent ‘JO’ leadership from flooding the election campaign with vast amounts of money, which they have collected through corruption while in power. However, a ‘JO’ leader countered the claim saying “they (the coalition) will not be able to throw money and abuse the state machinery as they pleased.” He did not wish to be named either. At least legally, the Government has no hold on the Election Commission to delay the local polls on the grounds that legislation would have to be introduced. The local polls figured when a group of United National Party (UNP) parliamentarians met with President Sirisena on Wednesday. They urged that the local polls should be held without delay. The MPs said that the UNP’s position was that it should be held by January next year. In fact, with this in mind, the party had summoned its Working Committee for a meeting last Thursday. It was cancelled after it emerged that the likelihood of a poll during that time is not likely. Sirisena noted that laws to control campaign funding would be introduced. He said that he too was in favour of the local polls being held as planned. “Matath oney chandey” or I also want an election, he added. There were also some tense moments for the group of some 25 MPs over a string of issues. One of them was to urge that Ravi Karunanayake be re-appointed to the Cabinet. He resigned over disclosures made before the Commission of Inquiry with regard the bond scam at the Central Bank of Sri Lanka (CBSL). Sirisena replied saying, “I did not tell him to resign. He quit on his own.” He then went on to criticise the media and declare that “mey maadye neetha sandarshanaya” or it was a very lowly portrayal of the episode as a ‘carnival by the media’. The remarks put paid to any further questions but raised new ones over who then asked the former Minister to hand in his resignation. Premier Ranil Wickremesinghe had insisted that he had not asked him to quit since he had not been found guilty of any charge. That was why he had set up an office for the former Minister at ‘Temple Trees’ and given him many official tasks, including party work. In addition, the security provided to him by the Ministerial Security Division (MSD) remains. Karunanayake who was present was to blame ministers who did not do their job for the ‘unfortunate encounters’ he faced. This meeting with the President came a week after Karunanayake hosted a group of MPs to a retreat at Tangalle to discuss political developments within the UNP and the Government. The former Finance and Foreign Minister who has now been tasked by his leader Ranil Wickremesinghe to carry out party work said there was greater discipline among them. However, their counterparts in the SLFP were engaged in unfounded criticism, he said. Sirisena noted that on both sides, coalition members were critical of each other. He said he would have to rein them in. Among the UNP MPs who took part in the discussion were Ashu Marasinghe, Hector Appuhamy, Mujibur Rahman, J.C. Alawathuwela, Wijepala Hettiaratchchi, Nalin Bandara, Chaminda Gamage, Vadivel Suresh and Chaminda Wijesiri. Sirisena also complained that even onetime President Chandrika Bandaranaike Kumaratunga had not backed him for a ministerial position or to become the General Secretary of the Sri Lanka Freedom Party (SLFP). Another Sirisena remark that caught the UNP MPs by surprise was the question of whether or not to abolish the Executive Presidency. The President declared he was in favour of abolishing it, much to the surprise of the UNP MPs. However, the party he leads, the SLFP has declared it was opposed to abolishing the Executive Presidency. In its report to the Constitutional Assembly on the draft Constitution, the party said: “The opinion of the SLFP is that complete abolition of the Executive Presidency, that is present today, is not prudent. Considering various terrorist and extremist activities that happen in various countries in the world, the SLFP believes a President should be elected directly from the public mandate with a certain amount of powers to protect the unitary status of the country and to keep and to protect the stability of the country specially in a situation where a large volume of power is granted to the Provincial Councils. Thereby, every ethnic group of the country without narrow ethnic, religious problems gets political power by selecting a president and gets the opportunity to become a member of the presidential election process, and hence, it becomes a practical method of reconciliation. Is there a difference of opinion between the SLFP and its own leader, President Sirisena over the future of the Executive Presidency? The question comes to the fore in the light of Sirisena’s remarks that he is in favour of abolishing the Executive Presidency. If indeed his party holds a different view from that of his own, there is little doubt Sirisena, as leader, could use his clout to change their thinking. On the other hand, if he wants pressure to build up within his own party for him to contest again, the current posture would be most helpful. In politics, after all, it is pressure over one issue or the other that moves minds to say one thing and do another. Not surprisingly, developments that will impact on a future presidential or parliamentary election were playing out this week. On Friday, Sirisena launched an ambitious programme at the grassroots level titled Grama Shakthi. The idea behind is to enlist the support of Grama Sevakas or government officials at the grassroots levels in a poverty alleviation programme. These officials play a pivotal role and among other matters even compile electoral registers of those eligible to vote. The inauguration of the Grama Shakthi People’s Movement got under way on Friday at a ceremony at the Sugathadasa Indoor Stadium. President Sirisena shared a secret with some of the ministers present. They included Susil Premajayantha, Mahinda Samarasinghe, Sajith Premadasa and S.B. Dissanayake. He said that money for the project has been obtained from the Treasury. Sirisena said these funds had been set apart by his predecessor Mahinda Rajapaksa for a similar development project but had not been utilised. He said he would now use those funds and ensure that those in villages received at least an average income of Rs 8,000 per month. The significance Sirisena attaches to what seems his pet project is underscored by the priority the Presidential Secretariat is giving. An official source said among the measures formulated was to urge both public and private television channels to devote thirty minutes every week to report on the different aspects of the project. Similarly, the source said, the print media, both public and private, would be requested to devote half a page free of charge to report on the progress. In addition, periodic documentary films are to be screened for public information. A separate publicity programme is also being formulated for the social media. “The project will begin to pay dividends in the next two years or more. We hope to change the social landscape at the grassroots level, so people will appreciate our efforts,” the official source added. Sirisena told Friday’s inauguration event that during the first phase of the project, opportunities would be given to people in 5,000 selected Grama Seva Divisions to build “people’s co-operative societies. One of the objectives was to give “strength to implement rural development plans with the proper understanding of the market opportunities, with the contribution of women and youth.” Sirisena said that “priority should” be given for “the conscience” rather than the circulars and orders. He also said that all the Districts and Divisional Secretaries should be the pioneers in the development process but not the leaders in the field of administration. Sirisena has told Ministers and MPs that they should factor in their development agendas bearing in mind the new programme. He said he would review progress regularly. A noteworthy feature of the periodic postponement of both provincial and local elections is the deafening silence of Western diplomatic missions in Colombo, the international NGOs and other public action groups. During the previous Mahinda Rajapaksa administration, reams of paper were used by them to regularly condemn what they called anti-democratic acts, violation of human rights and protest over a multitude of other issues. This time however, delays in PC and local polls have drawn no comment from them. No doubt, the coalition enjoys the greater confidence of the international community, particularly the Western nations. However, growing public discontent over current developments, though obscured by events in other theatres abroad, could become a costly affair. More so, when elections delays are being caused with impunity and disregard to the public wish.